UNITED NATIONS, November 20, updated -- Libya's cash-fueled rehabilitation from terrorist state into the mainstream moved a step forward on Friday, when Moammar Gaddafi's son Saif al-Islam Gaddafi quietly slipped into the United Nations for a 1 p.m. event in the Delegates' Dining room. Sources on November 19 told Inner City Press, "Gaddafi is coming." (In candor, they did not specify father or son, mea culpa.) He was not on the public agenda of Secretary General Ban Ki-moon. But Ban met his father in January of this year in Addis Ababa. Earlier this month, Moammar Gaddafi signed cooperation agreement with his Belarusian counter-part Alexander Lukashenko "related to the economic, judicial and cultural sectors." Both countries are known for their judicial systems. "We hail Libya's position as a non-permanent member of the United Nations Security Council on strengthening its role as a guarantor of international peace and security. We will do our utmost to make you proud of our relations," Lukashenko was then quoted in his government-controlled press. But at the UN since Libya joined the Security Council, its representatives have virtually never spoken to the press at the stakeout. Even during the Council's Africa tour in June, Libya's Ambassador snubbed the few reporters on the trip. Another country's Ambassador quoted to Inner City Press this Libyan comment, that over 20 years of visits to Chad, their had been no positive development. This same Ambassador opined to Inner City Press that Libya had support the May 10 assault on Khartoum by the Chad-based Justice and Equality Movement. Update of Friday afternoon -- Inner City Press staked out the Delegates' Entrance at 12:45. Already there were Libya's Ambassador and UN Security, who directed Inner City Press into the otherwise empty press pen. When Saif al-Islam Gaddafi arrived, Inner City Press asked a question about what has been accomplished in Libya's ten months on the Council. "I'll answer later," Saif al-Islam al-Gaddafi said. We're still waiting. 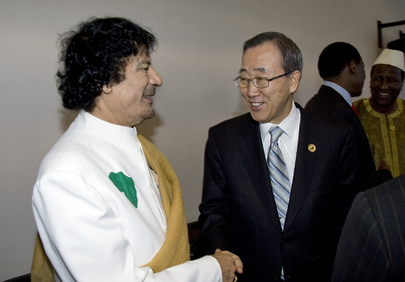 UN's Ban and Libya's Gaddafi: discussing justice systems? In the UN Secretariat lobby there is a photo exhibition displaying and implicitly praising Belarus' "Rays of Light." At an opening reception earlier this week, in which the participants were strangely walled-off and hidden from view, UN officials heaped praise on the country's government. A passing human rights advocate stopped and rolled his eyes. What he told Inner City Press is, for now, off the record.